There is so much goop on the market now to help clean your floors and yes it does work – but it costs a fortune. Here are some natural and cheap ways to clean your floors at home – and they will be just as clean and shiny as new! You have a few options with sealed floors. The easiest of all is by using boiling water and 1/2 cup white vinegar. If you don’t have vinegar, another option is methylated spirits. Just a cap full in a bucket of boiling water will clean your floors and make them shine. The smell won’t last! Just be careful where you leave the bucket because the boiling water can leave a ‘ring’ just like a coffee cup – so use an old towel or rug to sit it on whilst you’re working. If you want your house to smell lovely and fresh, add a cap full of eucalyptus oil. Steam mops are also a great option. Exactly as above BUT – don’t use a steam mop on unsealed floors. Boiling water will get them clean – but extreme steam can damage them. The best way to clean tiles is a bucket of boiling water and 3/4 teaspoon of washing up liquid. It leaves the tiles streak free and squeaky clean. If your grout is really really dirty, use an old toothbrush and a paste of water and bicarb – it will bring the grout up as good as new! Slate floors are a lot of work. There, I’ve said it. But we will still cover how to get them clean! Step 1: Use a light broom to sweep the obvious dust away. If you have something like a swiffer, that would work perfectly! Step 2: Use warm water only and a 1/4 cup white vinegar to very gently wash it. Wring your mop out often and first mop in one direction, then mop in the opposite direction – this will get into all the groves and natural movements of the slate. Step 3: Dry mop the floor daily to keep it looking good. 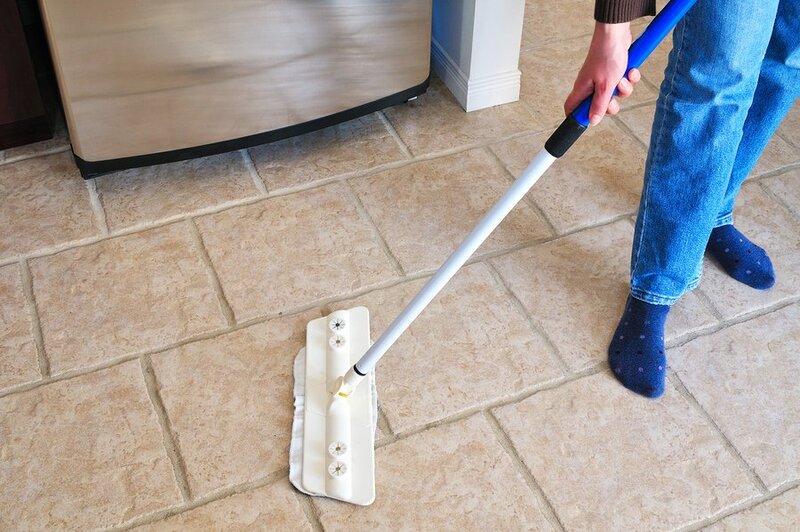 The steam mop is the perfect invention for lino – but if you don’t have one – don’t despair. Use boiling water and two cap fulls of eucalyptus oil. The eucalyptus oil will get rid of any stickiness that seems to lodge into the ‘divits’ in the lino. If it feels ‘sticky’ after mopping, go over it with plain boiling water.